How do you keep your dog entertained when the weather is warm and the humidity is high? Throw them a pool party, of course! 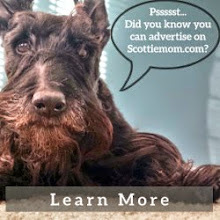 Break out the kiddie (or should we say Scottie?) pool as well as some squeaky toys and treats, and the pups will be set for a bit of fun in the sun. Unless, of course, your dog is like Nibbles - who clearly wasn't thrilled she had to bob for squeaky toys in a tub filled with water. Perhaps she thought it was a B-A-T-H. Or maybe she didn't want to "ruin" her pretty coat. 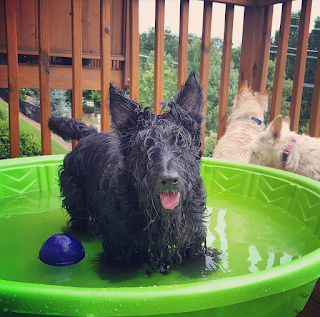 Whatever the case, she only participated in the fun when prompted and once in the pool, she took the opportunity to lap up a cool drink. No splishing, no splashing. The rest of the time, she waited for one of the boys to fish out a toy before stealing it and running to the corner. 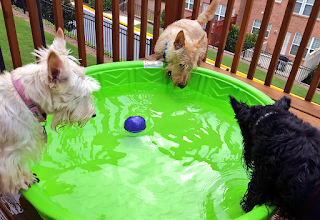 Pudley and Mr. K spent the most time in the bright green pool. 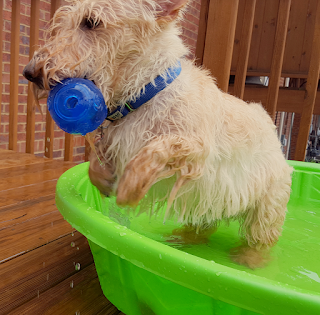 Mr. K dived in and out in pursuit of squeaky toys. Pudley, seemingly unsure what to think at first, was a bit hesitant until he discovered the water hose. Suddenly, he could not wait to get in the pool and attack the pesky water that dared fill the area with water. I caught this adorable video of Pudely taking on the water hose. Fun as it was, we had to pack up and head in when the weather turned and signaled a storm was coming. 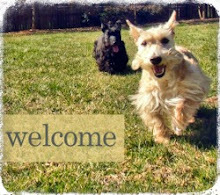 Everyone piled on the beach towel in an attempt to dry off quickly and then zoomied their way back into the Scottie House where snacks awaited. 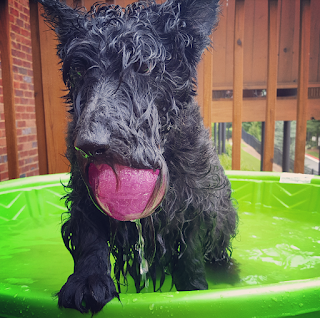 Tell us: does your Scottie like playing in the water or do they prefer to stay dry and watch from afar like Heather and Nibbles? 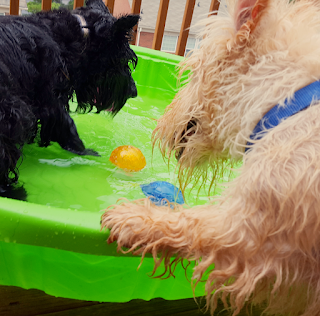 We have a scottie pool. But the first and only time we used it. Bella played in the water--rolled in the dirt--water---dirt...etc. So everything was MUD! Your pups look like they're much cleaner! Kyla hated water-a full water bowl was cause for suspicion. If it is a pool where I can swim I'm in but if it is the hose or sprinkler I'm out of there.